German Physiks is the brand name of loudspeakers produced by DDD Manufactur GmbH, which is located in Maintal, just outside Frankfurt in Germany. The company came into being in 1992 with the launch of our first model, the Borderland MK I. The Borderland is now in its MK IV version and has consistently been our top selling product. The company was set up to manufacture loudspeakers using the omnidirectional driver designed by Peter Dicks: a German engineer. We refer to this driver as the DDD driver – Dicks Dipole Driver. All design and manufacturing is done in Germany. Manufacturing in Germany is the only way we can guarantee the consistently high level of quality that we require. We build our loudspeakers in small production runs, which allows us to put more care and attention into each set of loudspeakers than is possible with high volume manufacture. More on the company history may be found on our main web site at http://bit.ly/Q7w9of. 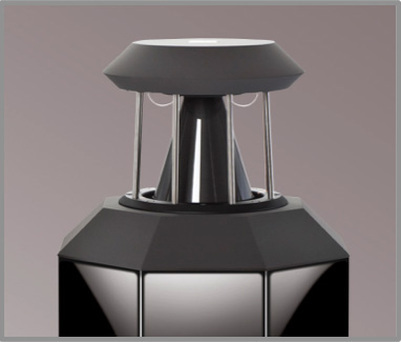 German Physiks loudspeakers are totally different to any other loudspeakers, both technically and visually. The DDD driver we use is unique to us. It is a wide bandwidth, omnidirectional driver and was inspired by Lincoln Walsh’s “Walsh Driver,” which was used in the classic Ohm F loudspeakers. It is the result of several years of detailed computer modelling, refined by the production of numerous prototypes. The current version uses a very flexible carbon fiber diaphragm coupled to a conventional magnet/voice-coil assembly. It operates very differently from the drivers in conventional loudspeaker designs and will be explained in more detail in the next section. The original version of the DDD driver used a titanium foil diaphragm and we still manufacture this. It has a narrower frequency range than the carbon fiber version we now use and is not so rugged. The carbon fiber version is very rugged and will withstand abuse that would damage most other drivers, but we do not advise German Physiks loudspeaker owners to test this in case they are having an unlucky day. In addition, the upper frequency limit is higher, 24kHz vs 21.5kHz and the bottom limit is lower, 70Hz vs 120Hz (when driven direct). The DDD driver is used on all of our models. Consequently, all our loudspeakers can provide a very high level of sound quality and our entry-level model – the Unlimited MK II – can give the customer a very large taste of what the higher end models can do. One, two or four DDD drivers are employed in our various speakers, depending on the maximum output level required. The principal improvements as you go up our range are that we the use of more sophisticated crossover designs to provide more resolution and better dynamics, and the larger bass systems which allow us to produce deeper and better quality bass, together with higher bass output levels. Our flag-ship Gaudi MK II model produces bass going down to 15Hz and a maximum output level of 120dB. The DDD driver uses three modes of operation. 1. At the bottom end of its operating range, it is pistonic, the same as the drivers used in conventional loudspeaker designs. Here the diaphragm and voice coil move back and forth together like the piston in an automobile engine. 2. Second, bending wave radiation, in which the voice coil causes the thin diaphragm to flex and a wave to travel along its surface. 3. Third, modal radiation, in which areas of excitation are created on the diaphragm surface like those formed by a stone being dropped into water. It is the skillful combination of these three operating modes that give the DDD driver its very wide operating frequency range. The operating range of the driver depends on the particular model it is used in, but for the carbon fiber version, the lower limit is generally around 200Hz and the upper limit is 24kHz. In one German Physiks design, the Unicorn MK II, a single carbon fiber DDD driver covers the range from 40Hz to 24kHz. 1. Very accurate and realistic stereo images. As stated above, the DDD driver has a very wide operating frequency range, typically 200Hz to 24kHz, so there is no crossover point in the mid-range. This eliminates the level and phase errors that a conventional crossover can create from in the region where our hearing is most sensitive, and this enables German Physiks loudspeakers to produce very focused and realistic stereo images. Because one driver is producing the vast majority of what you hear, the sound is much more coherent than when it is split over several different drivers – each in a different position and each having a different radiation characteristic; consequently the sound from our loudspeakers is also more transparent. You really can hear a lot more of what is going on and that helps to create the feeling that you are listening to a musician(s) rather than a hi-fi system recreating one. There is a genuine feeling of emotional involvement, which is the main purpose of music. 2. Excellent stereo images enjoyable from a wide range of listening positions. The DDD driver’s omnidirectional radiation pattern enables the excellent stereo images it produces to be enjoyed from a wide range of listening positions in the room. This gives more flexibility in where you sit and allows several people to enjoy a good sound simultaneously, so you can share your music with others. Contrast this with conventional loudspeakers that tend to have a small “sweet-spot,” that usually only one person can fully enjoy. This “broad-imaging” ability is also very useful in home theatre systems, where there may be several listeners. In addition, because our loudspeakers do not restrict you to a small “sweet-spot” in order to hear the best sound, they provide a more relaxed listening experience. This is especially noticeable when you listen for long periods. At audio shows we often see people testing this “broad-imaging” ability by walking around the room as they listen and even going behind the loudspeakers, where they still find a stereo image. 3. Very even tonal balance throughout the room. The drivers in a conventional loudspeaker increasingly beam the sound as the frequency rises, rather than radiating it evenly around the loudspeaker. This is unavoidable and is due to the physics of this that type of driver. Consequently, you generally only obtain the correct tonal balance when seated in a narrow range of positions in the room – the “sweet-spot.” The DDD driver’s omnidirectional radiation pattern ensures that the tonal balance of the music is much more even throughout the room. This provides a more natural reverberant acoustic and also assists in giving more flexibility where you sit. This, together with point 1 above, means that you can set up our loudspeakers up to give excellent results in the preferred listening position in the room, but still be able to enjoy excellent imaging and tonal balance in other parts of the room. This can be useful if you don’t want to be tied to one place for your listening. The use of bending wave and modal radiation gives the DDD driver a very low moving mass and this provides an exceptional dynamic response. 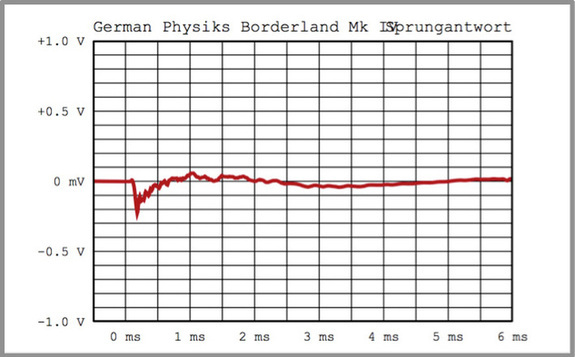 This is shown below in an impulse response for a titanium DDD driver measured by the German magazine AUDIOphile in a review of our Borderland MK IV model. The reviewer, Holger Biermann, described it as, “A model example of impulse precision.” You can find the full review at http://bit.ly/1jEg5GT. The DDD driver’s excellent impulse response helps to reveal the delicate nuances of what is being played. The resultant transparency is maintained even at high levels, providing a more musical and natural presentation. These properties greatly enhance the enjoyment of high quality stereo systems and are also very useful in home theatre systems. Modern movie soundtracks can be very detailed. In many cases not only will there be a large orchestra that on its own covers a very wide frequency and dynamic range, but there may be complex sound effects sections, as well as many voice tracks. The DDD driver’s exceptional speed and low distortion allow it to clearly resolve all the components in even the most complex soundtrack and so provide a much more enjoyable and exciting viewing experience. Another advantage of the DDD driver’s low moving mass is that is causes very little energy to be fed into the cabinet, which helps to minimize cabinet resonances. In addition, our cabinets’ rigid construction and use of Hawaphon™ damping material ensure that residual cabinet coloration is extremely low. Furthermore, the DDD driver’s excellent dynamic response means that it does not compress the music the way other drivers may, consequently you are less likely to feel the need to turn up the volume in order to obtain a satisfying playback level – unless you are a fan of very high levels. This is better for the long-term health of your hearing and because you are avoiding very high playback levels, you will be able to hear more detail in the music. 5. The tonal characteristics of musical instruments are very accurately portrayed. The DDD driver is phase-linear across its operating range, ensuring that the tonal character of each musical instrument is reproduced with great accuracy. You get a great sense of hearing a live musician rather than a recorded one. In a home theatre system this makes sound effects more believable and is particularly noticeable on complex and very dynamic effects. 6. Set up is quick and easy. You can find the full review at http://bit.ly/1bnbKPi. It also means that the customers are less likely to have to rearrange their rooms to accommodate our loudspeakers, which will make their spouses happy. We don’t advise our customers to try this for themselves in case they go too far and damage their loudspeakers. This resistance to abuse is useful if the loudspeaker is to be used in a household with small children, or spouses who dust everything. You cannot do this to drivers made from brittle materials such as ceramics, diamond or beryllium. A detailed explanation of the DDD driver may be found on our main website at – http://bit.ly/1jLZekr The DDD Driver. In our experience there are two common misunderstandings. 1. Omnidirectional loudspeakers cannot produce a good stereo image. 2. Some people say they prefer the sharp imaging of conventional loudspeakers. The very sharply defined imaging that we have grown used to with conventional loudspeakers is actually not what you will usually hear in a real concert. Audiophiles have simply come to accept it, partly because it is what they are most used to listening to from their systems, and also to some extent due to a lack of familiarity with live music. If you attend a live concert, you will rarely hear imaging like this. This is because the bulk of what we hear there is an enveloping sound field of reflected sound, rather than direct sound. The DDD driver recreates this enveloping sound field in a way that a conventional loudspeaker cannot. German Physiks loudspeakers do produce very good stereo images, as the reviews attest, but they do so in a manner that is closer to a live performance, and reproducing this is what our goal should be, not creating something that never existed. Ultimately this is a matter of personal preference. How do German Physiks compare to other omnidirectional loudspeakers? With one exception, all the other omnidirectional loudspeakers we are aware of use drivers that are “narrow band” and so must have a crossover point in the midrange, where our hearing is most sensitive. German Physiks loudspeakers all use our DDD driver, which due to its very wide bandwidth as mentioned above (24kHz to approx 200Hz), means there is no crossover point in the midrange. This gives improved clarity and coherence and near-perfect time alignment. What amplification works best with German Physiks loudspeakers? Our loudspeakers will work well with both solid state and tube electronics, which makes system matching quite easy. Any tube amplifier used must have a 4 ohm output tap. On bi-amped systems, using a solid-state amplifier for the woofer and a tube amplifier for the DDD driver can work very well. Hawaphon® is the trademark of Korff AG, Switzerland. www.korff.ch. Walsh® is the trademark of Ohm Acoustics Corporation, USA. www.ohmspeakers.com.